Kenya is actually the world leader in the number of solar power systems installed per capita. More Kenyans are turning to solar eco power every year rather than making connections to the country's electric grid. due to a number of challenges that they face when they are connected to the national grid. First and foremost the national grid includes high cost of buying power from Kenya power. This has necessitated the need for regulations in the sector which has increased the solar power installations. These regulations came about as a consumer protective measure to ensure that low quality solar products and poorly trained or unqualified technicians do not infiltrate the market. The regulations required that all ERC licensed personal only be allowed to design , install, manufacture, sell and distribute solar PV systems, the vendor will be completely liable if any faults in design and specification of complete solar PV system, except in situations where customers purchase individual system components from different vendors in which case they shall be indicated in the signed system declaration that they do not require the said design or specification from vendor or contractor. A list of licensed technicians and contractors is provided on the ERC website. 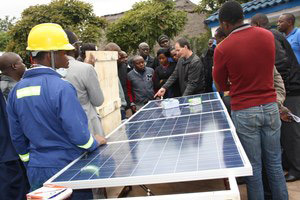 Furthermore we have seen more and more factories install solar panels on their rooftops to counter against, the cost of buying power from the grid and also mitigating against the instability of the grid since power fluctuations are a regular feature of the Kenyan industrial and residential landscape.